News for those who need it: Gumroad now accepts Paypal! That means all my digital products -- my Sam and Fuzzy e-books, my Pin-up art collection, and my other art ebooks and desktop backgrounds -- can now be purchased by Paypal instead of credit card, if that is your preference. If it is... have at it! We return on Friday with a new comic and a new round of Q and A! If you have a question you'd like me to answer, just pop it into an email with "Q and A" in the subject line! A new story begins today! I hope you all enjoy it. Have a lovely Monday, friends. With a little bit of luck, my copy of Splatoon will arrive today, and I'll have time to play it for at least five minutes! Friends! Starting today, I'm appearing at Northwest Fanfest in New Westminister, just a few Skytrain stops outside of Vancouver. It's being held at the beautiful, brand new Anvil Center,and it should be a fun time! You can find me and my pal Alina at Booth 18 in the exhibitor hall, right near the front door. AND YOU SHOULD. I readily admit, Hiveworks has such a huge lineup that there are many member comics I've never read! But just off the top of my head, some of the comics I have read and really like are Amy T Falcone's slice-of-online-life Clique Refresh, Abby Howard's spooktacular Last Halloween, Michael Lunsford's universe-hopping epic Supernormal Step, and Ananth and Yuko's everything they do. And for sure, Atomic Robo is pretty great as well! There are probably some others I'm forgetting as well. It's a big line-up! It's interesting! Everyone knows what a print publisher does... they print books! But you don't need a publisher to make a website. So what does an online publisher/imprint actually do? In the case of Dayfree Press, we were honestly just a group of friends who regularly teamed up to exhibit at conventions. We used the Dayfree Press name for our booths, and so we carried that brand name over online as well. Later, when Topatoco took over most of our online sales, it made more sense to exhibit under the Topatoco name. So the Dayfree name just kinda fell into disuse. Because I've been around since the dark ages, I have most of that business stuff sorted out already. But I do like the idea of cross-promoting with other webcomics and discovering new stuff. And I was also looking for someone to take over the management of my adspace, which has become kind of tedious. So that's why I agreed to become a Hiveworks "affiliate"! 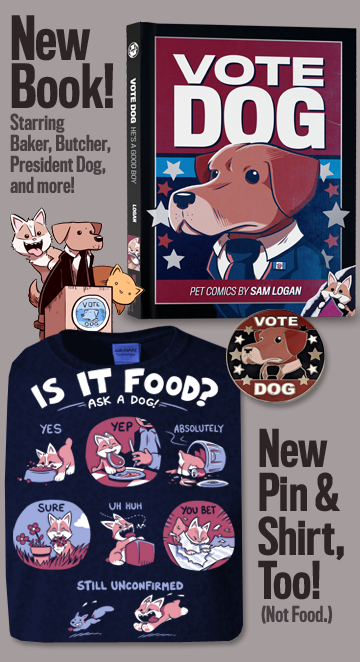 I get to keep doing my own thing, but Hiveworks will be helping me with my ads and doing some promotion for Sam and Fuzzy, while I do some promoting of their member comics. Beyond those two things, nothing is really going to change around here. But they're two things that I think will be worthwhile! That's a good idea, Claire! 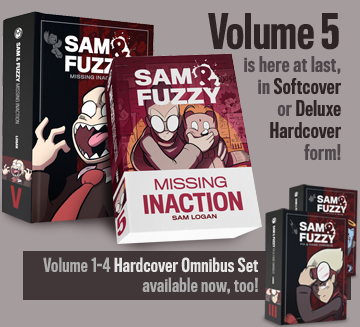 Sadly, the Sam and Fuzzy forum is woefully in need of a software update... but let me see if I can take care of that. If I can, I'll add a new RPG subforum that folks can use! That's a wrap for this week, team. See you again on Monday!